I’m extraordinarily proud to share our first SFCPAP performance outside of our home turf in sunny Disneyland! Our 80 kids were amazing, as our Fans, Ribbons, Lions, and Drummers performed for a half hour to a crowd of hundreds of exciting park visitors (many of which were friends and family of West Portal). Our alumni students, attended Leadership & Mentorship classes where they dabbled in such delights as active listening, sweating the details, working together, and making confident decisions. One of my favorite activities was discussing “problem solving”, and the hidden basketball court in the Matterhorn…. All of our students were treated to a dance workshop where they worked on some new dance routines, which I hope to see during our breaks during the parade! Thank you WPPC, and our amazing community, for your support. Programs like this one are only possible because we support them! Hello Year of the Monkey! Television footage from the 2016 Southwest Airlines Chinese New Year Parade in San Francisco featuring our amazing students and alumni of San Francisco's very own West Portal Elementary School. Thank you @KTVU for the footage! Launch in YouTube app if possible. Let's kick off the beginning of a new season! It’s with a heavy heart to let our community know that Buff Harding passed away the first week of September, 2015. For West Portal Elementary and CPAP, his team, the Dragon Runners, is the heart of our program. The magnificent, colorful, flashing, electrical taped Dragon was hand crafted by Buff himself many, many years ago! We never quite knew exactly when practice was, we never quite knew exactly where practice was, and we never knew exactly where they were on Parade Day. When I think back about what makes our community so special, I think of Buff. "Please welcome San Francisco’s very own West Portal Elementary Drummers and Daly City’s AMAZING Silver Dragon Kung Fu Lion Dancers." "…and now please give it up for San Francisco’s World Famous West Portal Elementary Fan and Ribbon Dancers. " 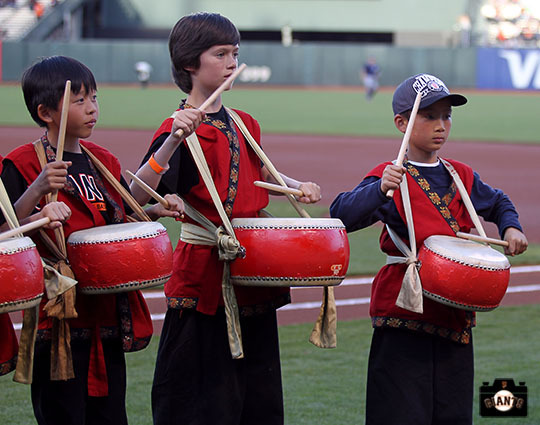 On 28 May, our incredible kids, with their family and friends, performed at ATT Park for the SFGIANTS Chinese Heritage Night. 75 performers and 150 of their biggest fans came to welcome guests, eat hot-dog-bows, guzzle soda, dance with Lou Seal, and watch our hometown heroes, the SF GIANTS in a classic 7-0 pitching duel against the Atlanta Braves. We could not be more proud of our family. Our community is capable of AMAZING. I promise that with your support, we will reach even higher in the coming years. A few snaps from the SF Giants Promotions & Event Production Team. On 8 May 2015, the West Portal Elementary Chinese Performing Arts program of San Francisco accepted first place in the 2015 Southwest Airlines Chinese New Year Parade, Special Schools Category. We are honored to be a part of such an incredible community which celebrates our Asian American, San Franciscan, and community roots. #SFCPAP would like to thank the Harlan Wong of the Chinese Chamber of Commerce, the Honorable Willie Brown, Mayor Ed Lee, and the venerable Rose Pak. congratulations west portal elementary cpap! This is a quick thank you to all the incredible children, families and friends of West Portal Elementary, who marched yesterday in one of the most beautiful parades I can remember in my SIXTH year of participating. @PARENTS: Your kids probably don't understand this now, but when they are in high school, or in college, or when they start to have families of their own, they will remember nights like these, and think about how awesome it was to perform in The Southwest Airlines Chinese New Year Parade in San Francisco, cheered on by thousands [UPDATE: over a million] of screaming & happy crowds, blinded by the bright lights of Union Square, and think back on what it means to be a part of something so BIG. We showed the world what it means to be a member of the Chinese American Community, what it means to be from San Francisco, and what it means to reach for the stars. @KIDS: You are awesome. It will take you a long time before you understand exactly how proud we are of you. So, as we end the season, go off and do your next big thing, and surprise us! Because next year will come sooner than you think! CPAP kicked off the beginning of the Chinese New Year Celebrations in San Francisco's historic Chinatown neighborhood, on 14 Feb 2015. We dazzled and amazed tourist and locals to with our amazing Drummers, Fans, Ribbons, Stilt Walkers and incredible parent volunteers. During this time of celebration, please take a moment to let our kids know how proud we are of their hard work, and our tell our parent volunteers how important it is to keep traditions like this alive and flourishing. Welcome year of the Ram! I wanted to take a quick moment to thank the incredible community of West Portal Elementary. CPAP and Silver Dragon Kung Fu, kicked off the new year season by performing at the Asian Art Museum today! It was an incredible departure from our "normal" stage performance routines. I am inspired by our kids, and their ability to teach. As you know, one of the programs missions, is to encourage our kids to give back as they get older, by coming back and teaching the younger kids what they learned from their mentors. This holiday season, please take a moment to reflect, and be very proud of what your kids have accomplished. Please let your kids know, how proud you are of what they do. Our kids are doing something very very special. Thank you for building an incredible community to which we are a part! Visitors of all ages are invited to watch beautiful lion dances and musical performances, and participate in Asian art activities. Students from the Chinese American International School and China Dance School and Theater will be performing traditional and modern music performances, while students from West Portal Elementary School’s Chinese Performing Arts Program will teach visitors how to walk on stilts, dance with ribbons, and do martial arts. Children’s book author Oliver Chin will also be in attendance, reading stories about Chinese zodiac animals and their characters. Don't ever let our kids forget how incredible it is to be a San Franciscan! Check out our new photos on the SF Giants MLB blog! We will never forget our first performance with our World Champion San Francisco Giants! Click down there to see our amazing on-field performance! Desperately Seeking Fashion & Theater Help! CPAP is looking for new volunteers or a program partner who can help our Stilt team refresh and maintain costumes for the new year. Your work will be showcased at many internationally promoted events, such as the SF Giants, Golden State Warriors, SF Asian Arts Museum, and of course, the SF Chinese New Year Parade. And you will be working with a fantastic group of kids ranging from 10-17 years old! Here are a couple of pictures to give you an idea of the awesomeness you'll be faced with! ...thank you san francisco's amazing photographer @ken! Thank you all very much for all your hard work and dedication to the program! I was very impressed with the HUGE crowds at the stage this year. And especially happy to see both teams hanging out together at the stage performance and for pictures at "the boat". Stilts did a great job hanging out with the kids (and elderly :^P) passing out balloons and mardi-gras beads! @PARENTS. Your help is deeply appreciated and does not go unnoticed. The strength of the program is set atop your shoulders. Our kids are able to participate in programs like this, because of you.